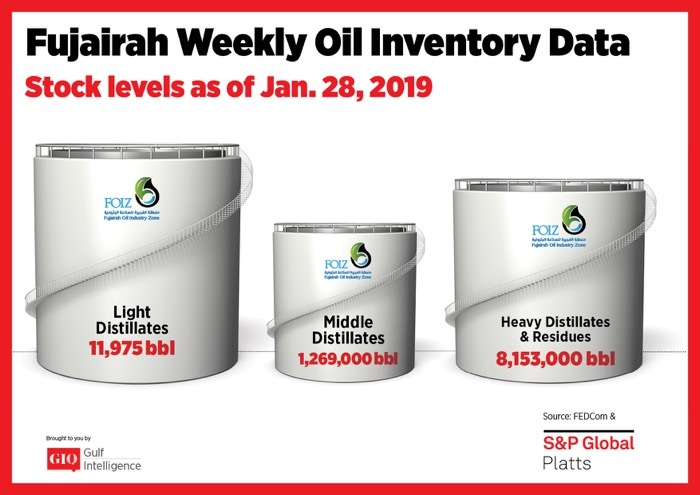 As of Monday, January 28 total oil product stocks in Fujairah stood at 21.397 million barrels. Inventory levels rose by 5.2% week on week. Stocks of light distillates saw a hike of 14.6% week on week to hit a record 11.975 million barrels. This is the highest recorded level since stock reporting began in January 2017, the previous record high was seen on November 5, 2018 when 10.84 million barrels were recorded. The gasoline market was characterized as being chronically oversupplied, with stock builds in the US and Singapore in recent weeks piling downward pressure on the market. Gasoline cracks in Asia remained in negative territory with the FOB Singapore 92 RON gasoline crack spread to front-month ICE Brent futures assessed at minus $1.66/b at the Asian close on Monday. Stocks of middle distillates slumped by 14.5% week on week to 1.269 million barrels. This is the second lowest level recorded, with stocks last lower on December 4, 2017. Overall the market was seen as largely range bound for gasoil across Asia. “The market is [moving] so sideways,” a gasoil trader said Tuesday. In addition, with the Lunar Year upcoming this was expected to lead to a fall in market activity across parts of Asia in the days ahead. Stocks of heavy residues fell by 3.1% week on week to 8.153 million barrels. Overall supply for bunkers in Fujairah remained ample while demand was muted in the port, traders noted in recent days. The discount between the port and Singapore seen in recent weeks remained. The spread between Fujairah and Singapore delivered bunkers was seen at $17/mt on Tuesday.